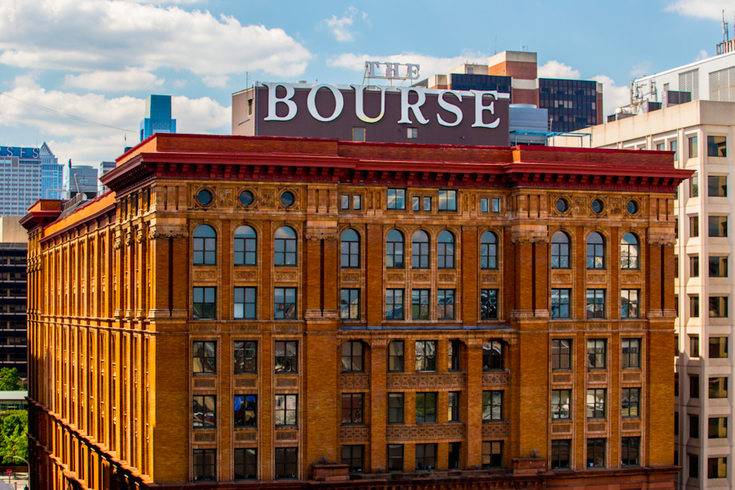 Completed in 1895, the Philadelphia Bourse Building originally served as the first commodities exchange in the United States. Three types of masonry were used on the facade: Carlisle redstone, Pompeian buff brick and terra cotta. The Bourse Marketplace, a new, upscale food hall in Old City, will officially open on Thursday, Nov. 15. Currently, 17 vendors are open (with abbreviated menus and hours) inside the century-old building, but you'll have to wait until next month for the full 30 to debut. The official ribbon cutting ceremony, which will include Mayor Jim Kenney, will take place at 9 a.m. on opening day. After, the food hall will open. The first 100 people who dine at 9 a.m. for breakfast, noon for lunch, and 5 p.m. for dinner will receive prizes and giveaways. Then the next day, Nov. 16, there will be hourly pop-up performances and more giveaways. Below is a list of the vendors. Once The Bourse officially opens, you'll be able to search the website to view more info on each one. If a vendor has a star next to its name, that indicates it's already open in the food hall. • #GetFried Fry Café – This gourmet fry shop will specialize in made-to-order french fries that can be covered with different toppings, and other finger foods. • Freebyrd Chicken – Freebyrd uses only responsibly raised chicken from Pennsylvania. On the menu will be a selection of chicken sandwiches with homemade sauces. • Bricco Pizza – A traditional Roman-style pizzeria that uses imported Italian ingredients. • Break Juicery – This spot boasts an array of juices, smoothies, açaí bowls and wheatgrass shots crafted with locally sourced and organic fruits and vegetables. • TAPS Fill Station – Philadelphians will enjoy local beer, cider, wines, mead and kegged cocktails on site or can fill their bottles to take with them. • Abunai Poke – Enjoy a taste of Hawaii with the selection of poke from this quick-service eatery. • Rebel Taco – This taco spot uses fresh ingredients and spices to create authentic Mexican fare. • 3rd and Ferry - Easton's acclaimed fish market’s new concept will boast an expansive raw bar with oysters, crab cakes, chowder, lobster rolls and other New England-style food. There will also be a full-service bar. • Baby Buns – Sylva Senat, who was on Bravo's "Top Chef," created this eatery's concept, which "brings unique international flavors that redefine an American classic – the hamburger." • Bonatsos Flower Shop – This family-owned business serving the Greater Philadelphia area for 75 years will continue to delight locals at The Bourse with seasonal plants available as bouquets, plus potted plants, hanging plants and terrariums. • Bluebird Distilling – There will be a full craft cocktail bar and retail store. The distillery is located in Phoenixville, Chester County. Recently, Bluebird Distilling also opened a tasting room in Center City. • Chocodiem – The store will sell hand-crafted artisanal chocolates based on classic Belgian recipes. The flagship location is in Easton, Pennsylvania. • Pinch Dumplings – The authentic hand-pinched Chinese dumplings will be made in-house daily. * Mi & Yu Noodle Bar – This fast-casual concept offers artisanal ramen, udon and pho. * Chaat and Chai – If you're craving Indian street food, go here. The restaurant closed its South Philly storefront to prepare for the move. * Grubhouse – This eatery serves breakfast seven days a week. * Ka’moon – Find fast-casual halal-prepared Egyptian cuisine here. * Kari's Tea Bar – Hailing from West Chester, each unique tea is carefully hand-blended with organic and fair trade ingredients. Look for a wide variety of loose tea blends, as well as superior grade matcha. * Olive with a Twist – Find fine cheeses, charcuterie and other gourmet products that can create gorgeous cheese plates or picnic spreads. * Marino Brother's Cheesesteaks – Menu offerings range from a classic cheesesteak to a creative interpretation of a pizza steak. * Prescription Chicken – All the chicken-based soups you need. * Scoop DeVille – A Philadelphia institution since 1989, Scoop DeVille lets guests makes custom ice cream combinations. * Rustica Rosticceria – An authentic sandwich shop where Italy and Philadelphia meet. In addition to their signature sandwiches, Rustica offers rotisserie chicken and a variety of side dishes. * Bronze Table by Vera Pasta Co. – Serves made-to-order pasta meals, alongside Italian wines and freshly packaged pasta to-go. * Mighty Melt – A collaboration between Mighty Bread Company’s Chris DiPiazza and Stargazy’s Sam Jacobson, Mighty Melt offers inventive grilled cheese sandwiches crafted from fresh artisan breads with creative flavor pairings. * Takorean – The D.C. eatery has expanded into the Philadelphia market. Find Korean and Latin-America fusion fare at Takorean, including Korean tacos, rice bowls and salads. * Menagerie Coffee – The speciality coffee shop serves artisanal coffee and a variety of small bites seven days a week. * Penzeys Spices – Includes a vast selection of spices, packaged individually and as gifts. * Barry’s Buns – Freshly baked goods are made daily. Specialties include sticky buns, cinnamon rolls and Philadelphia butter cake. * Lalo – Enjoy Filipino comfort food at this fast-casual spot. The menu will rotate seasonally and Lalo also serves beer and cocktails.